In May 2018, YouTube began testing a questionable solution to its problem of proliferating conspiracy theory videos—inserting a link to Wikipedia articles about the event that the conspiracy theories relate to. YouTube was criticised for not consulting Wikipedia, before using their material for this program. 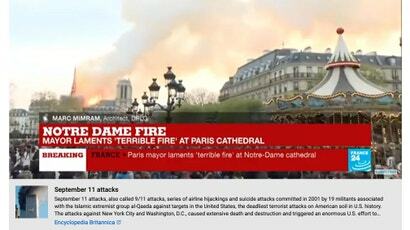 A month later, Encyclopedia Britannica announced it would allow YouTube to share its fact-checked information. 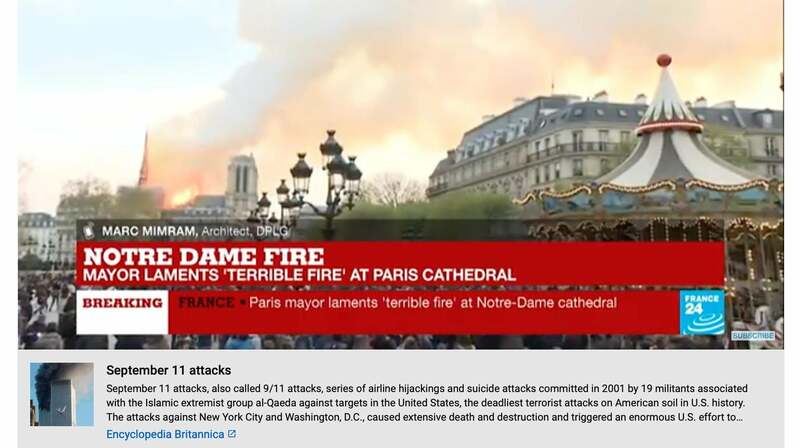 Early this morning, journalists Joshua Benton and Timothy Burke shared instances of YouTube videos showing live footage of the Notre Dame fire including links to Encyclopedia Britannica’s page on the 2001 terrorist attacks, with the image showing a very different building burning.